The licensed Sponge Bob Square Pants large jumper brings this pineapple under the sea to dry land. Fans will love seeing Sponge Bob and his sidekick, Patrick scampering along the ocean floor, on a wild jellyfish hunt! The warm waters of the Pacific Ocean will bring hours of bouncy entertainment, where even Squidward makes an appearance. This Sponge Bob Square Pants large jump is also available in a more manageable medium-sized jumper. 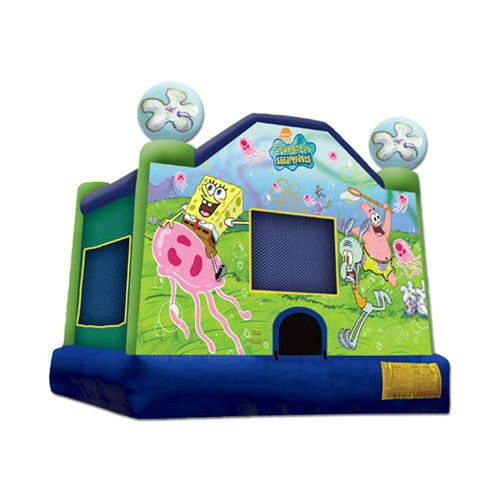 * Please call us for any questions on our spongebob 15 foot x 15 foot bouncer rentals in Rocky Mount and Wilson NC.